This is the first study of the philosophy of Maimonides by the noted 20th-century rabbinic scholar and thinker, Rabbi Joseph B. Soloveitchik. Based on a complete set of notes on Rabbi Soloveitchik’s lectures on Maimonides’ "Guide of the Perplexed" at the Bernard Revel Graduate School, this work constitutes a major contribution to our knowledge of both Maimonides and Soloveitchik. In these lectures, as recorded by Rabbi Gerald (Yaakov) Homnick and edited by the noted scholar Lawrence Kaplan, Rabbi Soloveitchik emerges as a major commentator on the "Guide". 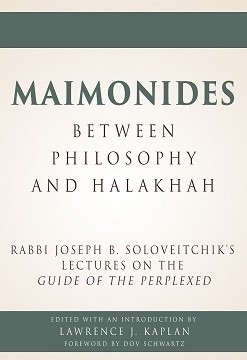 In a wide-ranging analysis he eloquently and incisively explores diverse topics in Maimonides’ philosophy, such as his views on prophecy; the knowledge of and approach to God; divine knowledge; human ethics and moral excellence; the divine creative act; imitation of God; and the love and fear of God. Rabbi Soloveitchik also undertakes an extensive and penetrating comparison and contrast of Maimonides’ and Aristotle’s philosophical views. Over the course of these lectures he develops a very profound and challenging overall approach to, and interpretation of, the "Guide’s" central and critical issue: the relationship between philosophy and divine law. 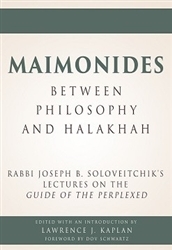 An illuminating work, "Maimonides – Between Philosophy and Halakhah" sheds a bright light on the thoughts of two great philosophers and rabbinic scholars.